“Most of the work was in getting the spark lit,” Luther Dickinson says of assembling the all star cast for his extraordinary new project. The debut album ‘Solstice’ comes complete with a great soundtrack and an impeccable guest list, one that boasts Amy Helm, Birds Of Chicago, Amy LaVere and Shardé Thomas among others. Dickinson manages to put the spotlight on his friends and the result is a collection that brings together some of the most captivating female voices in modern American roots music and filters each of their distinctive personalities through a singular vision of artistic community and musical exploration. We can’t wait to see some of the stars, Amy Helm and Birds Of Chicago, grace our stage along Dickinson as they unveil some of the new album! Luther Dickinson is a founding member of North Mississippi Allstars and South Memphis String Band. He’s widely known and respected, with numerous collaborations and Grammy nominations. 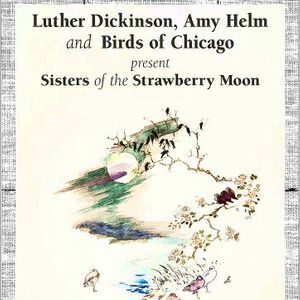 Amy Helm is the daughter of the legendary Levon Helm, with a powerful voice. Bird Of Chicago’s secular gospel sound will round out the Americana roots sound.